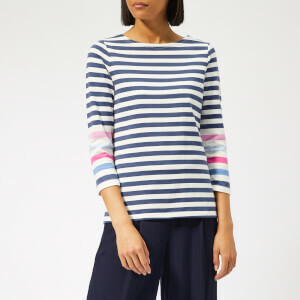 The Joules 'Harbour' top showcases the brand's much-loved Breton stripe in a navy and white colour palette. 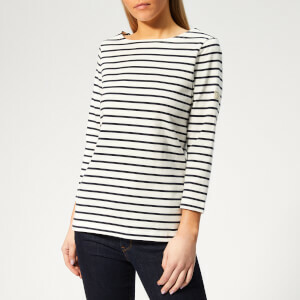 Cut from soft cotton jersey, the relaxed fit top comprises a boat neckline, long sleeves and a curved rear hem. The signature hare logo and embroidered branding also feature. Complete with a woven patch on the left arm. Model is 171cm/5'7.5" and wears a size UK 8.